Delorazepam, also known as chlordesmethyldiazepam and nordiclazepam, is a drug which is a benzodiazepine and a derivative of desmethyldiazepam. It is marketed in Italy, where it is available under the trade name EN and Dadumir. Delorazepam (chlordesmethyldiazepam) is also an active metabolite of the benzodiazepine drugs diclazepam and cloxazolam. Adverse effects may include hangover type effects, drowsiness, behavioural impairments and short-term memory impairments. Similar to other benzodiazepines delorazepam has anxiolytic, skeletal muscle relaxant, hypnotic and anticonvulsant properties. Delorazepam is mainly used as an anxiolytic because of its long elimination half-life; showing superiority over the short-acting drug lorazepam. In comparison with the antidepressant drugs, paroxetine and imipramine, delorazepam was found to be more effective in the short-term but after 4 weeks the antidepressants showed superior anti-anxiety effects. Delorazepam is also used as a premedication for dental phobia for its anxiolytic properties. High doses of Delorazepam may be administered the night before a dental (or other medical) procedure in order to provide relief from anxiety-associated insomnia that night with the effects persisting long enough to sufficiently treat anxiety the next day. Delorazepam has also demonstrated effectiveness in treating alcohol withdrawal. Delorazepam is available in tablet and liquid drop formulations. The liquid drop formulation is absorbed more quickly and has improved bioavailibility. Delorazepam is well absorbed after administration, reaching peak plasma levels within 1 – 2 hours. It has a very long elimination half-life and can still be detected 72 hours after dosing. Bioavailability is about 77 percent. Peak plasma levels occur at just over one hour after administration. Significant accumulation occurs of delorazepam due to its slow metabolism; the elderly metabolise delorazepam and its active metabolite slower than younger individuals, resulting in a dose of delorazepam accumulating faster and peaking at a higher plasma concentration than an equal dose administered to a younger individual. The elderly also have a poorer response to the therapeutic effects and a higher rate of adverse effects. The elimination half-life of delorazepam is 80–115 hours. 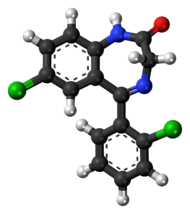 The active metabolite of delorazepam is lorazepam and represents about 15 - 24 percent of the parent drug (delorazepam). The pharmacokinetics of delorazepam are not altered if it is taken with food, except for some slowing of absorption. Delorazepams potency is approximately equal to that of lorazepam, being ten times more potent by weight than diazepam (1 mg delorazepam = 1 mg lorazepam = 10 mg diazepam), typical doses range from 0.5 mg - 2 mg. Treatment is generally initiated at 1 mg for healthy adults and 0.5 mg in pediatric and geriatric patients and patients with mild renal impairment, treatment is contraindicated in patients with moderate or severe renal impairment. Delorazepam hosts all the classic side-effects of GABAA full agonists (such as most benzodiazepines). These include sedation/somnolence, dizziness/ataxia, amnesia, reduced inhibition, increased talkativeness/sociability, euphoria, impaired judgement, hallucinations, and respiratory depression. Paradoxical reactions including increased anxiety, excitation, and aggression may occur and are more common in elderly, pediatric, and schizophrenic patients. In rare instances, delorazepam may cause suicidal ideation and actions. The most serious effect of long term delorazepam use is dependence, with withdrawal symptoms which mimic delirium tremens presenting when delorazepam use is discontinued. Although the withdrawal effects from delorazepam are generally less severe than its shorter-acting counterparts, they can be life-threatening. Slow de-titration of delorazepam over a period of weeks or months is generally suggested to minimize the severity of withdrawal. Psychological effects of withdrawal such as rebound anxiety and insomnia have been known to persist for months after physical dependence has been successfully treated. Delorazepam is contraindicated in those with severe schizophrenia or schizo-affective disorders, those with a known allergy or hypersensitivity to delorazepam or related benzodiazepines, and those with moderate to severe renal impairment (delorazepam is sometimes administered at a reduced dose to patients with mild renal impairment). Delorazepam is generally considered to be contraindicated in patients with severe acute or chronic illnesses but is occasionally used in the palliative care of terminal patients during their last days/weeks of life. Patients with a history of drug and/or alcohol abuse are believed to have an increased risk of abusing delorazepam (as well as all other benzodiazepines), this must be considered when a physician prescribes delorazepam to such patients. Although all patients being treated with delorazepam should be routinely monitored for signs of abuse and diversion of medication, increased monitoring of patients with a history of drug and/or alcohol abuse is always warranted. Benzodiazepine abuse in patients taking them as prescribed on an as-needed basis for chronic/refractory anxiety, insomnia, and intermittent muscle spasms has occurred and generally occurs very slowly, becoming evident only after months or years since the initiation of therapy. Monitoring of patients actively using delorazepam should never be discontinued even if the patients has been stable on the medication for many months or years. Caution must be used when delorazepam is administered alongside other sedative medications (ex. opiates, barbiturates, z-drugs, and phenothiazines) due to an increased risk of sedation, ataxia, and (potentially fatal) respiratory depression. Although overdoses of benzodiazepines alone rarely result in death, the combination of benzodiazepines and other sedatives (particularly other gabaminergic drugs such as barbiturates and alcohol) is far more likely to result in death. People with renal failure on haemodialysis have a slow elimination rate and a reduced volume of distribution of the drug. Liver disease has a profound effect on the elimination rate of delorazepam, resulting in the half-life almost doubling to 395 hours, whereas healthy patients showed an elimination half-life of 204 hours on average. Caution is recommended when using delorazepam in patients with liver disease. Nordiclazepam is used as the precursor with which to make Uldazepam via the thionamide. ^ Govoni, S.; Fresia, P.; Spano, PF. ; Trabucchi, M. (Nov 1976). "Effect of desmethyldiazepam and chlordesmethyldiazepam on 3',5'-cyclic guanosine monophosphate levels in rat cerebellum". Psychopharmacology. 50 (3): 241–4. doi:10.1007/BF00426839. PMID 188062. ^ "Benzodiazepine Names". non-benzodiazepines.org.uk. Archived from the original on 2008-12-08. Retrieved 2008-12-29. ^ Oliveira-Silva, D.; Oliveira, CH. ; Mendes, GD. ; Galvinas, PA.; Barrientos-Astigarraga, RE. ; De Nucci, G. (Dec 2009). "Quantification of chlordesmethyldiazepam by liquid chromatography-tandem mass spectrometry: application to a cloxazolam bioequivalence study". Biomed Chromatogr. 23 (12): 1266–75. doi:10.1002/bmc.1249. PMID 19488979. ^ a b Zimmermann-Tansella, C.; Tansella, M.; Lader, M. (Oct 1976). "The effects of chlordesmethyldiazepam on behavioral performance and subjective judgment in normal subjects". J Clin Pharmacol. 16 (10 Pt 1): 481–88. PMID 977791. ^ Cesco, G.; Giannico, S.; Fabbruci, I.; Scaggiante, L.; Montanaro, N. (1977). "Single-blind evaluation of hypnotic activity of chlordesmethyldiazepam in No-placebo-reactor medical patients". Arzneimittelforschung. 27 (1): 146–8. PMID 322671. ^ Scarone, S.; Strambi, LF. ; Cazzullo, CL. (1981). "Effects of two dosages of chlordesmethyldiazepam on mnestic-information processes in normal subjects". Clin Ther. 4 (3): 184–91. PMID 6796270. ^ Andreoli, V.; Maffei, F.; Montanaro, N.; Morandini, G. (Feb 1977). "Double-blind cross-over clinical comparison of two 2'-chloro benzodiazepines: 7-chloro-5-(2-chlorophenyl)-1,3-dihydro-2H-1,4-benzodiazepin-2-one (chlordesmethyldiazepam) versus 7-chloro-5-(o-chlorophenyl)-1,3-dihydro-3-hydroxy-2H-1,4-benzodiazepin-2-one (lorazepam) in neurotic anxiety". Arzneimittelforschung. 27 (2): 436–9. PMID 16622. ^ Kostowski, W.; Płaźnik, A.; Puciłowski, O.; Trzaskowska, E.; Lipińska, T. (1981). "Some behavioral effects of chlorodesmethyldiazepam and lorazepam". Pol J Pharmacol Pharm. 33 (6): 597–602. PMID 6127668. ^ Curatolo, P.; Cusmai, R.; Trasatti, G.; Sciarretta, A. (1985). "[Effects of intravenous administration of chlordesmethyldiazepam on paroxysmal intercritical activity in various electroclinical forms of infantile epilepsy]". Riv Neurol. 55 (6): 377–86. PMID 3938567. ^ Bertin, I.; Colombo, G.; Furlanut, M.; Benetello, P. (1989). "Double-blind placebo cross-over study of long-acting (chlordesmethyldiazepam) versus short-acting (lorazepam) benzodiazepines in generalized anxiety disorders". Int J Clin Pharmacol Res. 9 (3): 203–8. PMID 2568350. ^ Rocca, P.; Fonzo, V.; Scotta, M.; Zanalda, E.; Ravizza, L. (May 1997). "Paroxetine efficacy in the treatment of generalized anxiety disorder". Acta Psychiatr Scand. 95 (5): 444–50. doi:10.1111/j.1600-0447.1997.tb09660.x. PMID 9197912. ^ Manani, G.; Baldinelli, L.; Cordioli, G.; Consolati, E.; Luisetto, F.; Galzigna, L. (1995). "Premedication with chlordemethyldiazepam and anxiolytic effect of diazepeam in implantology". Anesth Prog. 42 (3–4): 107–12. PMC 2148912. PMID 8934975. ^ Cazzato, G.; Gioseffi, M.; Torre, P.; Coppola, N. (Nov–Dec 1982). "[Prevention and therapy of delirium tremens with tiapride and chlordesmethyldiazepam]". Riv Neurol. 52 (6): 331–42. PMID 6130594. ^ a b Bareggi, SR.; Truci, G.; Leva, S.; Zecca, L.; Pirola, R.; Smirne, S. (1988). "Pharmacokinetics and bioavailability of intravenous and oral chlordesmethyldiazepam in humans". Eur J Clin Pharmacol. 34 (1): 109–12. doi:10.1007/BF01061430. PMID 2896126. ^ Dal Bo, L.; Marcucci, F.; Mussini, E.; Perbellini, D.; Castellani, A.; Fresia, P. (1980). "Plasma levels of chlorodesmethyldiazepam in humans". Biopharm Drug Dispos. 1 (3): 123–6. doi:10.1002/bdd.2510010306. PMID 6778522. ^ Bareggi, SR.; Nielsen, NP. ; Leva, S.; Pirola, R.; Zecca, L.; Lorini, M. (1986). "Age-related multiple-dose pharmacokinetics and anxiolytic effects of delorazepam (chlordesmethyldiazepam)". Int J Clin Pharmacol Res. 6 (4): 309–14. PMID 2875955. ^ Bareggi, SR.; Pirola, R.; Leva, S.; Zecca, L. (1986). "Pharmacokinetics of chlordesmethyldiazepam after single-dose oral administration in humans". Eur J Drug Metab Pharmacokinet. 11 (3): 171–4. doi:10.1007/BF03189844. PMID 3102240. ^ Bareggi, SR.; Pirola, R.; Truci, G.; Leva, S.; Smirne, S. (Apr 1988). "Effect of food on absorption of chlordemethyldiazepam". Arzneimittelforschung. 38 (4): 561–2. PMID 2900012. ^ Sennesael, J.; Verbeelen, D.; Vanhaelst, L.; Pirola, R.; Bareggi, SR. (1991). "Pharmacokinetics of intravenous and oral chlordesmethyldiazepam in patients on regular haemodialysis". Eur J Clin Pharmacol. 41 (1): 65–8. doi:10.1007/BF00280109. PMID 1782980. ^ Bareggi, SR.; Pirola, R.; Potvin, P.; Devis, G. (1995). "Effects of liver disease on the pharmacokinetics of intravenous and oral chlordesmethyldiazepam". Eur J Clin Pharmacol. 48 (3–4): 265–8. doi:10.1007/bf00198309. PMID 7589052. This page was last edited on 13 September 2018, at 01:32 (UTC).